Once fire crews transport a cardiac arrest patient to the hospital, they often don't hear the outcome, which is why it was a rare occasion for them to meet Ben Hess on Thursday. The Hess family — Ben, his wife, Kelly, and their six children — visited Fire Station No. 1 to bring buckets of snacks and express their thanks to the team of first responders who revived him on the afternoon of Friday, Dec. 30. 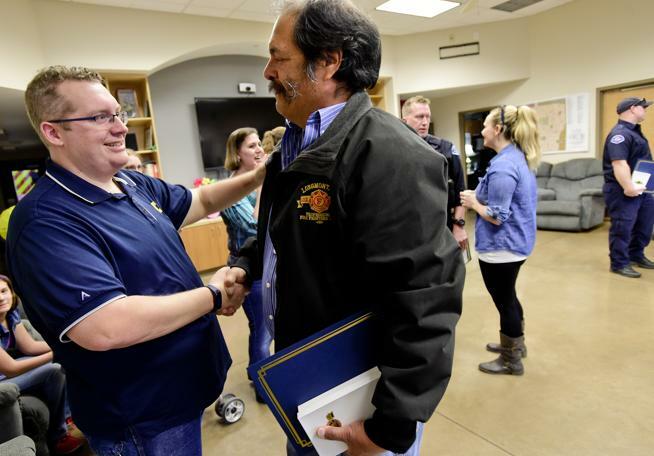 "It changed my life; it changed the life of my family," Hess said to the fire team. "We're very thankful for what you guys have done for us." Kelly Hess followed up, saying, "You're our heroes." The soon-to-be 40-year-old collapsed after his transaction at the FedEx counter at 980 Ken Pratt Blvd., about a mile from Fire Station No. 6. "We're like, that's pretty close," Lt. Mike Burelson said, recalling their thoughts when they received the emergent tone from dispatch. Two fire teams and an ambulance responded to the store, where they administered one AED shock to Ben Hess's chest before transporting him to Longmont United Hospital. "Kind of a convenient place to collapse," he said, "if I had to choose a place." They had to cut through his yellow University of Michigan shirt, which he joked Thursday that he had recently received for Christmas. Meanwhile, back on the day of the call, Kelly Hess was at their home in Loveland with his parents. "He had told me that he was going to be later than he expected, so I wasn't even worried yet," she said. She said she learned at about 5:30 p.m. what had happened and rushed to the hospital. Ben Hess was later taken to a Denver hospital for further evaluation. He had triple bypass surgery Jan. 3 and is now recovering. "I think more than anything, I'm just glad that they were there, that I can still have my husband and it's because of their wonderful service and their quick response," Kelly Hess said. At the fire station, the Hess family gathered, recounting the day and filling in Ben Hess' memory where it was patchy. His children received stickers, coloring books and a tour of the fire truck and ambulance. "We have six kids," Ben said in a conversation with the firefighters. "Who really need their daddy," Kelly continued. The following fire team received life-saving awards at the ceremony Thursday: Dispatcher Shelby Johns; Longmont Police Officers Cooper Arvisais and Cassidy Jones; Engine 2106 Firefighter/Paramedic Mike Connolly, Engineer Mike Freyta and Burelson; Truck 2116 Captain Troy Reed, Firefighter Nick Engen, Firefighter Jamey Martin and Firefighter Rusty Roper; and Ambulance 2121 Paramedic Jenna Steege and EMT Chandler Martinez. In 2014, the Longmont Fire Department implemented the "pit-crew resuscitation" model, improving response time to cardiac arrest calls. They also credit citizen CPR to helping while they're in route to a call.